Classic Kitchens & Interiors used a natural palette in the kitchen and baths of this grand woodland home, featured in Cape Cod Home. 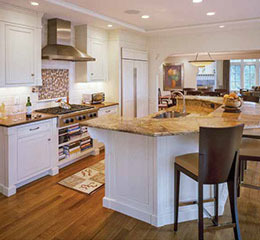 The kitchen has a transitional feel, with its white vintage finish and raised bar. The bath consists of cherry, Corian and a vessel sink.